Spend the night at a scenic campsite near the Bhira Dam reservoir and embark on a trek to Devkund waterfall. After you check-in at the campsite, you can relax with sunset views in the sky and a hot cup of tea in your hand. As the night falls, you can prepare and have delicious BBQ snacks in a fun DIY BBQ session and enjoy the starry night. The next day, you'll explore the dense Andharban forests and trek to Devkund. En route, catch gorgeous views of the Sahyadri hills, climb over mountain trails to reach the turquoise water pond of the Devkund waterfall. A minimum of 4 travellers are required to book the Devkund trek with camping at Bhira Dam. Located near the Tamhini Ghat, the Devkund Waterfall is surrounded by the dense, sprawling forests of Andharban. The trail to the waterfall is hidden in the folds of Western Ghats, with gorgeous views of the rugged terrain of high rising mountains and green fields. The Bhira Dam reservoir is a vast man-made lake fed by the waters of the Kundalika River. Your campsite, located near the lake, hosts alpine tents where you'll spend the night for an authentic camping experience. • Go camping at a nature-rich campsite near Bhira Dam. • Trek through the Andharban forests to Devkund. • Catch beautiful views of mountains and hills in the Sahyadri range. • Spend the night in alpine tents at the Bhira Dam campsite. A basic level of health and fitness is required to book this Devkund trek with camping at Bhira Dam. If you have respiratory conditions like asthma, blood pressure ailments, heart problems, and spine or knee conditions, please consult your personal physician before booking this trip. 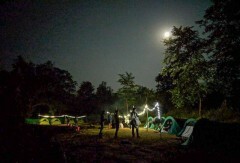 Travellers are required to follow instructions of the camp leader during the Devkund trek with camping at Bhira Dam. For cancellations made 8 days or more before check-in date of the Devkund trek with camping at Bhira Dam: 75% refund. For cancellations made 4-7 days before check-in date of the Devkund trek with camping at Bhira Dam: 50% refund. 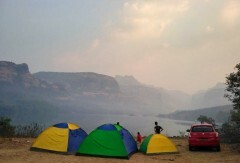 For cancellations made less than 4 days before check-in date of the Devkund trek with camping at Bhira Dam: no refund. Check-in time at the campsite is 17:00 hrs while check-out time at the campsite is 14:00 hrs. A minimum of 4 travellers are required to book this Devkund trek with camping at Bhira Dam. There is no pick-up for this Devkund trek with camping at Bhira Dam. There is no drop-off for this Devkund trek with camping at Bhira Dam. 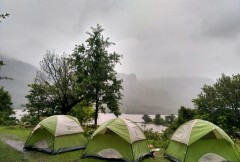 Day 1 of Devkund trek with camping at Bhira Dam: Check-in and enjoy! Arrive at the campsite near Bhira Dam by 17:00 hrs. After a stroll to explore the surroundings, you'll have some evening tea and relax with sunset views at the campsite. As the night falls, you can prepare and have delicious BBQ snacks in a fun DIY BBQ session. Have fun with your fellow campers and enjoy a calm and joyful night under the stars. Overnight in tents at the Bhira Dam campsite. Gorgeous views at your doorstep. Early in the morning, after breakfast, you'll head out from the campsite and begin the trek to Devkund. On narrow, nature trails with giant boulders and dense forests all around, you'll reach the waterfall. Spend some time at your destination and return back to the campsite for lunch. You'll check-out of the campsite by 14:00 hrs. Your trip ends here. 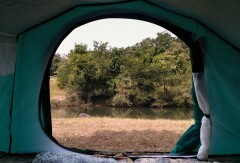 Overnight in tents at Bhira Dam campsite. You'll check-in at the campsite by 17:00 hrs. Today's meal package includes dinner only. You'll also be served evening tea and limited BBQ snacks. You'll be accommodated in tents, equipped with a sleeping mat and blanket. You may want to get an extra blanket since it can get quite cold at night. Today's meal package includes breakfast, served before the trek to Devkund, and lunch, served after the trek to Devkund. You'll check-out of the campsite by 14:00 hrs. The campsite, accessible via road, is located 80-km/2-hr drive from Lonavala, 100-km/3-hr drive from Pune and 125-km/3-hr drive from Mumbai.